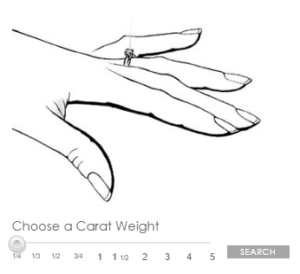 5 Carat Diamond Rings Insider Guide to Buying Intelligently! A 5 Carat Diamond Ring?! – 5 Reasons Your Fiancé Will Love it! The search for the right diamond ring is already daunting for first time seekers. So, I can imagine how puzzled you must be trying to figure out the perfect 5 carats for your girl! 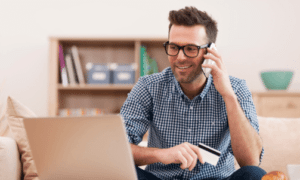 Most guys would simply ask help from brick and mortar stores or the fiancé’s best friend, but that’s not really your style. You like knowing for yourself, am I right? After all, the engagement ring is going to be worth a fortune. And on top of that, the sparkle of a great diamond will surely sweeten her much awaited answer! 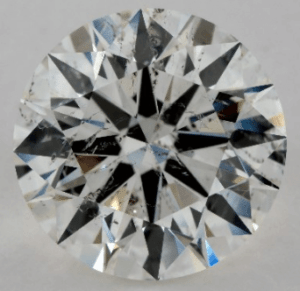 So in this post, I’m going to talk about the wonders of 5 Carats! Not only why she will love it but more importantly: How you can save yourself lots of money! If there is really one thing I care about it is people not overspending on diamonds! I suppose you already know that not everyone can afford it and not every woman can handle its grandeur, so you must be some kind of couple! 5 Carats is the size for the stars, thus, if you think she’s worth past the heavens, you’ll smoothly nod your head to these 5 reasons below. The engagement rings that top the headlines are usually big diamonds. And everyone is fascinated with a huge sparkle before their eyes. 5 Carats is large enough to be the talk of the town. It’s so big, its weight can be felt as you wear it! And its mammoth of a size comes with a steeper price range. I found this in-your-face depiction below in James Allen. The prices come with 360-degree view of specific diamonds which I really like because you can actually see how the gems differ with their super zoom. The average engagement ring size in the U.S. is 0.9ct, making 5 carats larger than life. It’s usually gifted to the upper class, notable names, and celebrities like Mila Kunis. Ashton Kutcher proposed to Kunis with a 5 carats that's said to be worth more than $260,000! If 5 Carats is made for the stars, then for your fiancé to love this size, she must be extraordinary. I bet she’s the type that will stand out in a crowd. Your lady’s tastes are world class. She likes extravagance, but she also settles to simplicity and elegance. Great quality inspires her more than anyone and her choices are always up to par. She can live with a modest diamond ring, but with a 5 carats, you’ll leave her speechless. This size is made for the above-average girl, and you know she is one. Anyone can be stunned upon seeing the 5 carats in person, but for someone to be so in love with it, she must be a diamond lover. She may be a collector or she dreams of having a carat weight that's one for the books! Since her style is paralleled to the nines, she will definitely appreciate a 5 carat diamond engagement ring – if not be awe-struck! Any diamond enthusiast couldn’t have said no to this. Rarity is synonymous to exclusivity. And being unique can catapult anything above and beyond. With 5 Carats, you can be sure that only a few hundred exist. Like their diamond display, I find the filter tool above very user friendly. It’s easy to see the numbers with something like this. Going further, the images show how much more 1 carats there are compared to 5 carats. Since the 1 carat mark is very popular, production of this size becomes rampant, leaving 5 carats with just 204 pieces, truly rare. Now that you know she’ll love 5 carats for sure, let me introduce you to your means in finding the biggest bang for your buck! 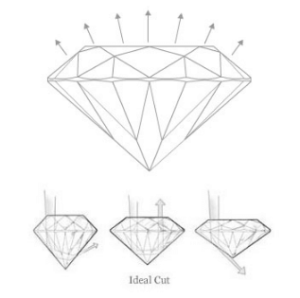 Most of the time, the diamond cut is mistaken for the diamond shape as some people refer to the form as cut i.e. princess cut, oval cut, and so on. But the cut is more than the outer dimensions of the gem, it’s what determines the diamond’s brilliance. 5 carats will reflect all the light that enters back to the viewer if it's cut to ideal proportions. And with great cut and symmetry, it will produce superb fire, brilliance, and scintillation throughout the gem. That said, always opt for Excellent and Ideal cuts. Although some exquisite diamonds can also have Very Good cuts. Here’s where you can really save! The diamond clarity grading labels diamonds as Flawless (F), Very Very Slight Inclusions (VVS1-VVS2), Very Slight Inclusions (VS1-VS2), Slight Inclusions (SI1-SI2), and Inclusions (I1-I3). We may automatically choose F or VVS1, but actually, you don’t have to right away. The trick is to look for Eye Clean 5 carat diamonds. Meaning, they don’t possess big, dark inclusions seen by the naked eye. It’s true that the more colorless a diamond is, the more icy-white it will appear, but let me teach you a leeway. 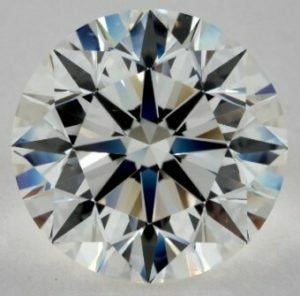 Since big diamonds like 5 carats tend to expose more body color, diamonds with colors D, E, and F branded as colorless become the initial choices. But then again, you can compromise and pick a lower grade because honestly, the difference in color is not too noticeable without a magnification loupe. Both gems have the same clarity, cut, and setting; only the color differs. As you can see, the J colored diamond is still pretty light, and if you’ll click the images, you may thoroughly compare their colors with HD 360-degree videos. After discovering an exquisite 5 carats, it’s best to find out if it’s legit. 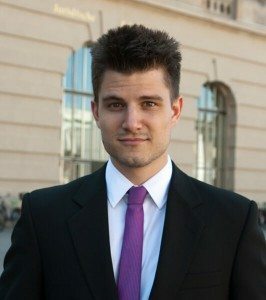 If you don’t know already, fake grading reports, unreliable labs, and scammers exist. So, what you can do is make sure your diamond is certified by the two most trusted labs in the U.S. – GIA and AGS. 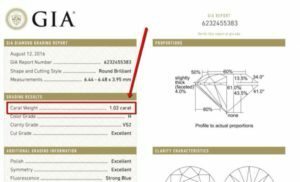 Aside from viewing the 5 carats from a 20x magnification video, make sure it's legit by checking the grading certificate with the right color grade, carat weight, clarity grade, and cut grade. It’s time hunt for your 5 carats! Back then, all you needed to do was ask a salesperson from a jewelry store and you’re given a few choices. These days, it's safe to buy diamonds online. And with the boost of technology, you’ll be able to view hundreds of thousands of diamonds in just a few taps! 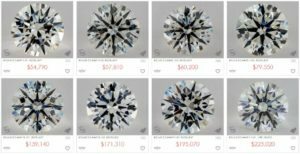 Online diamond shops exhibit less expensive gems because they don’t have to have the diamonds in stock and they don’t need commissioned salespeople to stir your buying process. You’ll be able to choose and examine the pieces at your own pace! He is the founder of Brian Gavin Diamonds and is a 5th generation diamond cutter from South Africa. With his motivation for perfection, he became one of the contributors of the renowned diamond pattern, Hearts and Arrows. Brian Gavin aims for the best cut imaginable, so expect the best cut 5 carats in his collection. Tying Brian Gavin at the top spot is Whiteflash Diamonds. Celebrated for “A Cut Above”, their signature diamonds are deemed as the best ones to be found. Whiteflash provides Idealscope, ASET and, Hearts and Arrows images that play important roles in identifying a superb 5 carats diamond. Then there’s James Allen. This diamond hub is considered as one of the best mainly because of their cutting-edge tool. They’re the first company that has introduced magnified HD 360 ° videos of each and every diamond! And this technology gives them a leverage when it comes to digging into the 4Cs of a 5 carat diamond ring. I’ve given you all you need to know about 5 carats and there’s actually more to learn once you start your search. Let me know in the comments section below if you think your fiancé is a 5 carats kind of girl. And if ever you need help applying what you’ve learned today, hit me up!